One of the most controversial buildings of the last few decades, this superblock in the shape of an opened-out paper clip comprises 549 social housing units. Its rounded end sections contain maisonettes reached from access galleries; the rest consists of four levels of porch-accessed flats. The precast concrete cladding panels are faced with different-coloured tiles patterning the facade in such a way as to make individual units indistinguishable. The facade on Rosestraat bears the inscription 'De Peperklip Anno 1980' in the tile pictures above the porches. The Peperklip stands as a built manifesto for the objective rationalist architecture and planning formulated by Weeber at the end of the 1970s. 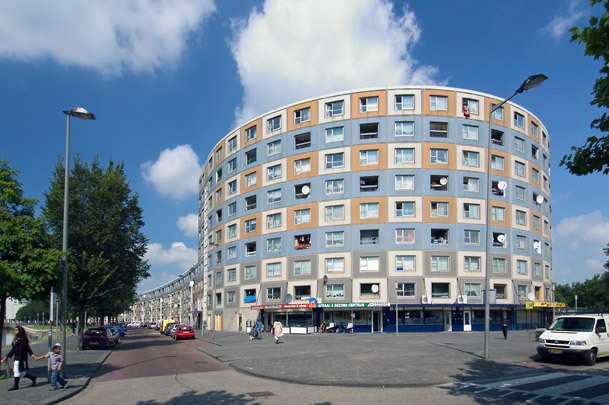 It inveighed against the cosy 'new frumpishness' of most Dutch housing in that decade, which Weeber saw as an attempt to use architecture to disguise the reality of small building budgets in social housing. Rationalizing the process and resorting to prefabrication could divert costs into providing better and more generously proportioned homes. A later, now-demolished superblock along the same lines, the Zwarte Madonna ('Black Madonna') in The Hague was, if anything, even more severe.